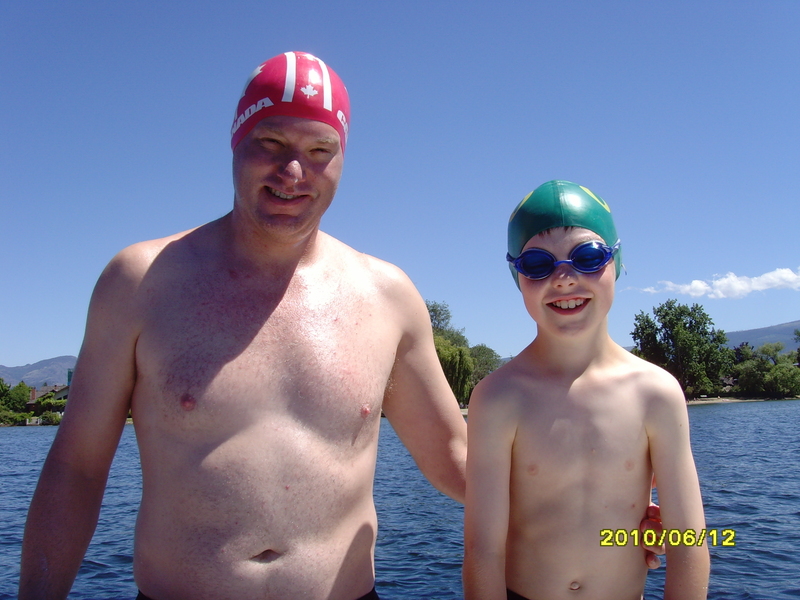 On June 12, 2010 I set out on training swim with friends from both the Okanagan Masters Swim Club and the North Vancouver Masters Swim Club. I must thank Mike Stamhius (support swimmer for 3 hrs), Claire Booth (support swimmer 1.5 hrs), Brent Hobbs (spiritual advisor and support swimmer for 4.5hrs), Chris Falk (boat support and feeds), Steve Ott who supplied the boat and his time and my fiancé Bonnie who took this opportunity to test her “sea Legs” and practice preparing the carbohydrate energy mix (feeds) for Brent and I. This proved to be a great experience as she will be at the helm as far as feeding during the Channel swim. The weather was a wonderful, sunny 26’F with a slight breeze from the North. The water temperature was somewhat cold at 60’F (15’C) and lake conditions were reasonably calm. I swam a total of 22-23km in 6 hrs and 10 mins: Overall, I was pleased with my performance. Every swim I learn something new and gain valuable experience in the open water. Physically, I lasted well in the cold water, but at the four-hour mark my arms turned to concrete. I hope this is a bi-product of cold water and will disappear as the water warms by a couple of degrees. I did not experience the same leg cramps that I had in my previous six-hour swim and I attest this to the amount of electrolyte I am using. Mentally, I was fine, but did notice that I had to dig deep to maintain any sort of pace the last two hours. You have to get comfortable in that cold feeling…kind of like having the air conditioning stuck on high in the middle of winter. To bring a perfect end to a great weekend Brent’s wife Joanne had us all over to their house for a wonderful dinner, including fresh lake trout as the main dish. I remember laying in bed that night thinking….”it’s so nice to be warm, full of good food and yes… I can sleep in!”. Way to go ROD!!! Congrats from everyone at Team Aquatic Supplies!! I guess we owe you some cash, well worth it. Rod alias “WONDER MAN”…Congratulations!! What an accomplishment – I am sure that all of your family and friends are very proud of you. Can’t wait to see your pictures and video. See you on the 3rd.